Review - What Is a Human? Without a doubt the answer to the question 'What is a human?' has been a long term and ongoing project -- perhaps as old as human life here on this planet. The question, simple in form and a mere four words long has been the center of attention for religion, philosophy, and the sciences for as long as those disciplines have been around. In a recent interview, Evans explained in answer to the question, What was the process of writing this book, and what came out of it that surprised you? "The process was that I conducted 90 in-depth interviews with Americans and a 3,000 person public opinion poll and matched that data together. A couple things surprised me. One is that I was frankly surprised that I did find evidence of this effect, that thinking of a human in particular ways would lead to thinking of humans like an object … Another was, I saw inductively in in-depth interviews the rise of type of perspective on the human that doesn't exist in humanistic literature at all which is that humans are those we decide are humans. That has some potentially negative ramifications, so socially on the one hand that's probably exactly how it work; we in a social group, collectively, have decided that dogs are not humans and are currently in the process of reevaluating chimpanzees and such, and we have decided that the people around us are humans. But to take that on as your normative position, that that's the way it should be, raises issues like 'what if we collectively decided that that person is not a human?' … So, it worried me that there was a subset of the population that endorsed this view of 'human,' not that they're going to go out and commit genocide but it seemed to me a very dangerous and touchy aspect of my research." The first distinction made is the one between "contested humans" ("entities that at least one major anthropology does not consider humans, such as fetuses, embryos . . . ") and "uncontested humans" ("entities that are considered to be humans by all commonly used anthropologies"). 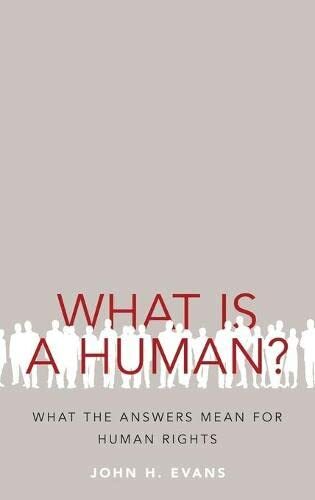 'What is a human?' matters, of course, because our human history is full of examples where by redefining 'human being' we have made it possible to kill millions of humans because we redefined them as less than human. One of the first tasks in training an army is to plant in the minds of the troops the belief that the enemy is not human: they are "vermin," "animals," "gooks," "commies," "terrorists'" or the like. The second distinction has to do with "anthropologies" by which Evans means, roughly, an academic belief system based on a particular approach to what will count as important facts, theories and discoveries in the discipline. He describes three prominent anthropologies that will be discussed and then tested by broad ranging survey questions and interviews to determine if there is a causal link between the "anthropology" and the public's attitudes toward human rights. Those who are believers in the Christian Theological anthropology may have a different belief about the rights of fetuses than do biologists. The three most prominent anthropologies he investigates are: (1) Christian Theological Anthropology, (2) philosophical anthropology, and (3) biological anthropology. From (1) people talk and write about souls, gods, special creation and the like and tend to hold that humans have rights just because "we are made in the image of god" whatever that may mean. Philosophy argues that we need to speak of "persons," "former persons," and "developing persons" in order rationally to discuss human rights issues like abortion, cloning, and euthanasia. And from biological anthropology those with biological training talk and write about life as being a chemical reaction or set of reactions sans magical or mysterious essence. "Life is simply a matter of chemistry." Evans claims the least reductionist of the three anthropologies is the theological while the most reductionist is the biological. Clearly, we humans have a particular DNA. It is not clear that our theology is clear - or even coherent. In the early chapters one wants to ask how would one go about showing that any given theological anthropology is anything more that a fictional construct created, as the old Tom Lehrer song suggests, "What you get out of it depends on what you put into it." The remaining chapters describe the survey materials and means for assessing the responses as researchers measure the influence of each of the three anthropologies on what the public says and believes about human rights and who has those rights. Evans sets out just what he wants to accomplish in the study and proceeds to do it. We learn that ideas and beliefs are important, can be propagated by institutions, writers, speakers, and can influence what others believe and do. John H. Evans is professor of sociology at the University of California, San Diego. He is the author of Playing God? Human Genetic Engineering and the Rationalization of Public Bioethical Debate. (2002, University of Chicago Press), Contested Reproduction: Genetic Technologies, Religion, and Public Debate (2010, University of Chicago Press) and The History and Future of Bioethics: A Sociological View (2012, Oxford University Press). In addition to writing about the structure of bioethics debates, he has also published a number of articles on opinion polarization in the U.S. over abortion, homosexuality and related issues.